The objectives of managing a wound by suturing are obvious and simple. The first is to avoid infection from taking root in the wound. The second is to help in stopping bleeding through the wound. A third is to provide a visually pleasing scar as opposed to a grotesque mass of tissue. Many case studies now focus on the aesthetic nature of the actual healing process of a wound rather than the probability of infection. This is because generally speaking the rate of infection is low regardless of the technique used. Although the basic techniques and principles related to tissue repair haven’t changed much in the last century, various options are available to make the overall operation a therapeutic experience. With the extensive study done in this field, medical practitioners have now developed topical anesthetics, tissue adhesives, and fast absorbing suturing material highly responsible for ensuring little to no amount of trauma for the patient. The use of sedation during the procedure, especially for difficult cuts, or for an anxious patient, has made suturing easy to tolerate for the family, the physician, and the patient. 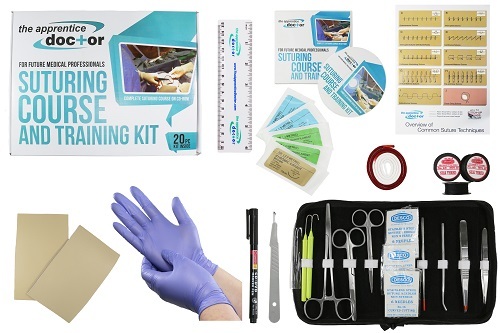 A Well-Equipped Suturing Kit is important for optimal suturing. It’s paramount to have the best quality instruments, which are the exact size for the location and nature of the wound that is being closed. The risk of infection is further decreased if the wound is handled carefully, and the instruments sterilized in the correct manner. Toothed forceps, with a hook to handle tissue. It’s very important to consider the suturing material that is used when performing the operation. In turn, choosing the right suturing material is made easy by considering the location and tension of the wound. Other equally important factors to consider about are the tensile and knot strength, handling of the wound, and tissue reactivity. Absorbable – This type of material is generally used for buried sutures that don’t require removal. They lose their tensile strength in less than 2 months and thus are highly absorbable. Non-absorbable – This type of material maintains the majority of tensile strength even after 2 months. It is non-absorbable and therefore used to close wounds on the skin’s surface and requires removal. The needles used for suturing are made exclusively for such a purpose, and comes in a variety of shapes and sizes for a specific wound. Curved needles for example, are only used on dermatological surgery. Cutting Needles – As their name suggests, these triangular cross-sectioned needles cut away at the tissue they are placed against. Less force is therefore required to pass the needle but it can leave small puncture wounds in place. They are generally preferred for suturing of the skin’s surface. Non-cutting Needles – These are more rounded in the cross section, and are used to push tissue aside and to close it around the suture. More force is used to operate as compared to cutting needles, and is therefore used for organ repair and subcutaneous closure. You can read more on suturing techniques here. Suturing Course and Kit course from The Apprentice Doctor! There is no need to wait on getting practice with suturing. Before you step into any situation requiring suturing, even an emergency in your own home, you can perfect your suturing skills. The Apprentice Doctor® Deluxe Suture Kit & Online Training Course teaches you how to confidently close wounds. Begin training today!